He ran unsuccessfully for reelection to the United States House of Representatives in the 1966 election. He resigned from the Senate and became Lieutenant Governor of Minnesota on December 29, 1976 after Rudy Perpich became Governor when Wendell Anderson resigned that office to become a United States Senator. Leadership Notes: He resigned from the Minnesota Legislature on December 29, 1976. Session Notes: He resigned on December 29, 1976 to become Minnesota Lieutenant Governor after Walter Mondale was elected Vice-President of the United States. 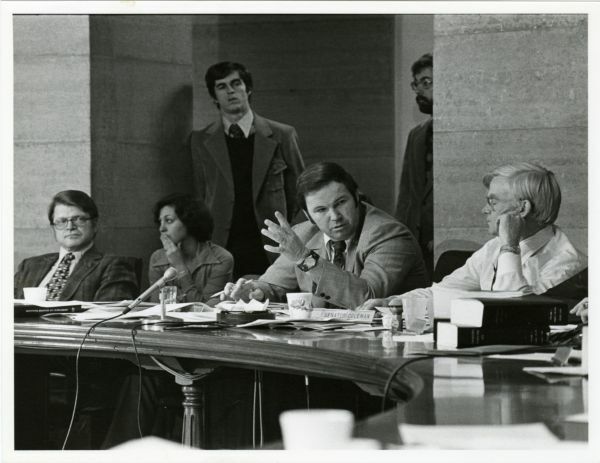 Senator Alec Olson, Senate staff person Peggy Ingison, Senator George Conzemius, and Senator Nick Coleman at a Senate committee hearing, St. Paul, Minnesota. 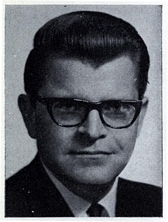 Alec G. (Gehard) Olson. Biographical Information from the Minnesota Historical Society's Governors of Minnesota. Olson, Alec Gehard. Biographical Directory of the United States Congress.